My name is Adrienne Cooper. I am a Native New Yorker and I grew up on the Upper West Side of Manhattan. My education was all through the NYC Public School System, and in High School I went to a specialized school for the arts where I concentrated on acting. Of course, coming from a family of artists whose success in the arts runs the spectrum, meant that I needed a fall-back plan, and so I turned to hospitality. After getting a BBA in Hospitality Management, with a concentration in Hotels/Resorts, I knew one thing: I didn't want to work in a hotel! So a few years later I had a career path going at a hotel! When I realized my fall-back had become everything, it was time to re-asses, and so far the pieces seem to have fallen into place. I found a marketing job with a food tour company, and the owner asked if I would be interested in guiding, given my background. The more I thought about it, the more I realized it was the perfect job for me, given: my mother's a tour guide, my friends always came to me for advice on good eats and I was always excited to show friends and family my favorite city in the world. So, I studied for the exam and got my license. 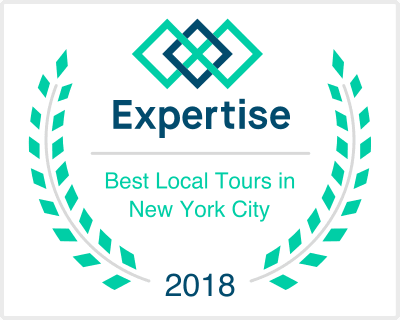 I left that company just a few months later for a variety of reasons, but mostly because I wanted to fill the void in tours above 14th street and outside of Manhattan. I also knew that leading tours I created personally would be even more exciting for myself and everyone around me! That's where I am today. I started with custom private tours, and I knew I wanted to create a holiday tour for the public, which is what initially inspired me to focus on the seasons. Today my seasonal obsession is not just a great tour model, but it's the way I live my life! I know that the love I have for what I do comes through on every tour I give, so for that alone I know you'll have a great time, but I also share some DAMN good food! And you don't have to take my word for it! Read some of my reviews here.